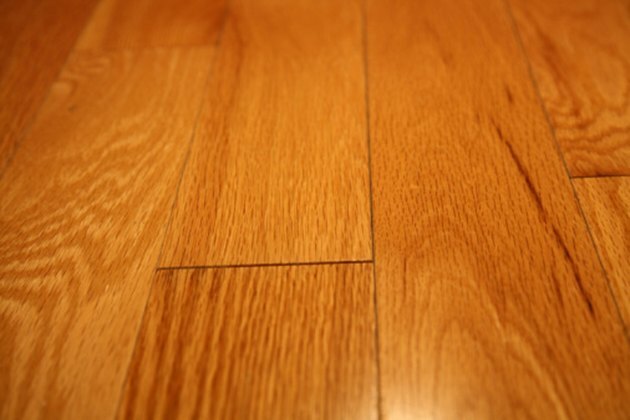 Identifying the finish on wood floors or furniture is necessary if you plan to strip and refinish the wood surface. Polyurethane is a highly durable finishing material that comes in high-gloss, gloss or matte finishes. Manufacturers make polyurethane from synthetic resins that are resistant to water and most solvents. Lacquer is a highly flammable finish when wet. It finishes dry due to evaporation of one or more of the chemical components and dries quickly to a hard and durable coating. You can't tell the difference between the two finishes just by looking at them, so you'll need to perform a test or two to tell the difference. Wood finishes protect the surface. Find a hidden spot on the floor or furniture. On floors, test the area under a piece of furniture or carpet. Test the back of furniture or inside of drawers and doors. Rub the edge of a coin back and forth over the hidden area while pressing firmly. If the finish flakes, the coating is varnish, wax or shellac. If the finish is resistant to the coin, the coating is polyurethane or lacquer. Dip the corner of a clean, soft rag into lacquer thinner. Rub the hidden area on the floor or furniture. If the surface layer dissolves, the finish is lacquer. If the surface remains unchanged, the finish is polyurethane. Place a cotton swab in some acetone as an alternative method and apply it to the finish. If it beads, you likely have polyurethane. If not, wait a few minutes. If it dissolves the finish, you probably have lacquer. Can Satin Polyurethane Be Applied Over Semi-Gloss?